My regular Sunday morning trip to Brixton Farmers’ Market always involves fresh soft pretzels from Luca’s Bakery, but I managed to branch out from just baked goods this week and I couldn’t resist picking up a few seasonal goodies in the shape of some British asparagus, fresh garlic and buffalo steak for the rest of the week. The buffalo steaks came from the amazing Alham Wood Cheeses stall which is so low key in the market I’m not sure it even has a sign. Only my finely honed mozzarella radar meant I noticed it…but it has some superb well matured cheeses as well as a small selection of buffalo meat each week. This stall is not to be missed if you are a serious cheese lover. They supply the succulent mozzarella for the top class pizzas at Brixton institution Franco Manca and it is a treat to be able to add this exceptional product to dishes at home. My eye was drawn to the juicy looking organic buffalo frying steak. Two well sized thin cut steaks weighing in around 180g cost an incredibly reasonable £2.34, reminding me that it is possible to eat ethically raised higher welfare meat even on my limited budget. 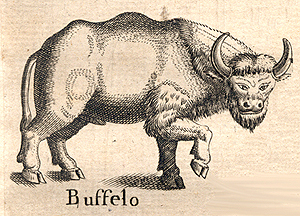 The fact that buffalo meat is also very low in fat and cholesterol was simply a bonus. I was definitely looking forward to trying buffalo meat for the first time! It was hard to find any recipes for buffalo, but I decided that I would treat it as I would a similar cut of beef. I cut it into strips, lightly coated it in garlic, black pepper and olive oil and allowed it to marinade for an hour or so before pan frying it with the fresh garlic and asparagus. I added the chopped asparagus and fresh garlic to a hot pan first and softened them, adding a splash of water to steam them slightly too. I then added the strips of buffalo and seared them for around 3 minutes, moving them all the time to make sure they didn’t overcook. Since I like my meat fairly bloody, I didn’t mind if the strips were at all pink in the middle, but they cooked through completely in the time they were in the pan. Keeping with the stir-fried style of the dish, I served the buffalo and asparagus over some noodles to soak up the rich juices from the meat. They made a good neutral foil to the other strong flavours of the dish and the contrast of the slightly chewy meat and the soft slurpy noodles was great. The meat was a little bit springier to eat than beef, but the flavour more than made up for this. Rich, slightly sweet but yet incredibly savoury, each mouthful just exploded with taste. The fresh garlic was beautifully subtle and the asparagus made this feel like the most luxurious midweek meal I have ever eaten! If you find the flavour most beef a bit wishy washy, I definitely suggest visiting your local farmers’ market (or looking online) for some buffalo meat. Incredibly tasty, easy to cook and of a much higher welfare standard than most beef out there, this delicious meat ticks all the boxes. I have a feeling I’ll be a happy regular at the weekly Alham Wood stall on Sunday mornings! Just keep an eye out for the stall with the best selection of cheeses you’ve ever seen and you’ve found buffalo heaven! Vive Colombia! Asparagus and Hollandaise sauce…heaven on a plate!